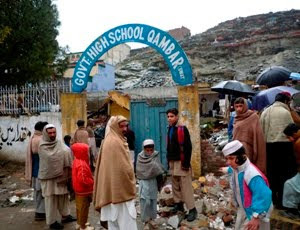 Pakistani girls are aghast at the destruction of schools in the Waziristan region. “The nihilistic Taliban are bent on taking the country back to the stone age,” laments Shazia Orakzai from Peshawar. “These barbarians don’t even care for theri own mothers and daughters. They do not respect the womb that gave them birth.” The girls of the land of the Indus are watching in horror as their country slowly falls prey to the obscurantist ideology of the terrorists. “We must do something, we can’t just stand by and twiddle our thumbs,” asserts Maria Maqbool, a fourth class teacher from Lahore. The whole of Pakistan is furious over the denial of womens education in the tribal areas. While schools have been closed across the country, the women of the Federally Administered Tribal Areas bear the brunt of the Taliban’s reign of terror. Taliban have been known to blow up schools and even kill female teachers. “We resolve to resist these brutal oppressors and continue with our lives,” writes in Sarah Khan from Bannu, a town just next to Waziristan. Much depends on the success of the Pakistan Army in Waziristan. With the destruction of the Taliban strongholds in FATA, the people (and especially the females) of the region are sure to breath a sign of relief. Education of females in developing countries is a must to fight poverty, but much work needs to be done in Pakistan where the majority of girls still can’t read and write.